The third edition of Midsummer Scene Theater Festival brings Hamlet to Forth Lawrence. But not just any Hamlet. For the first time, Dubrovnik audience will watch famous Shakespeare’s play with a lady in a title role. The famous Shakespearean tragedy is directed by Helen Tennison, and it will mark the 400th anniversary of William Shakespeares death. For this occasion, the major role is given to the actress Helen Millar, which is the opposite of classic English theater tradition according to which major characters must be played by the men. So this work also warns of the significant discrepancy between the male and female roles in the great classics. Hamlet in the vision of Helen Tennison is a woman who began to live as a man to inherit the crown. 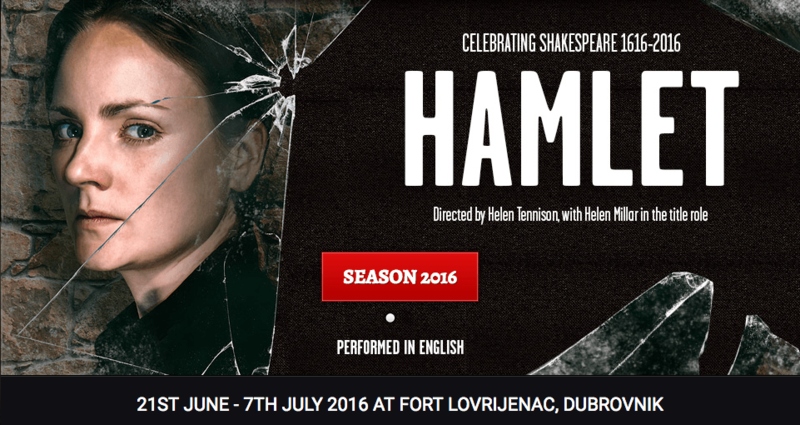 So this year’s Hamlet on Lovrijenac examines life through a different, female, prism. This year, Midsummer scene continues to cooperate with the Dubrovnik Symphony Orchestra – musicians will again perform under the stars at the Fort of St. Lawrence on June 28. Traditional Midsummer scene Festival will be held from the 21st of June to 7th of July. It is a project of the City of Dubrovnik and the Dubrovnik Tourist Board, produced and organized by Brilliant Events Dubrovnik and Honey -Tongued Theatre Productions London.